We acquired CENTURY four years ago after several years of use in a commercial herd. 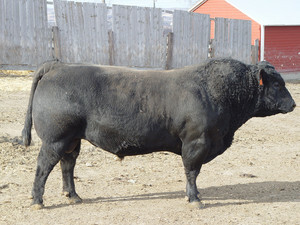 He is a full brother to the widely used and popular Salers bull, D MILLENIUM. CENTURY puts lots of thickness, muscle and performance into his calves who are all stamped with very gentle dispositions. His first daughters that will have data turned in are calving in 2007 and they look spectacular - lots of volume and fleshing ability with plenty of milk and nicely designed udders.